Is it really possible to ignite—or reclaim—a sense of “startup culture” in your workplace? Startups have them all in spades, powering innovation, pushing boundaries and propelling the dramatic impact entrepreneurs have on the marketplace. They run their companies with heart and transparency, fueling a special kind of culture that has become the envy of established organizations searching for that same energy and vibe. Startups are small and nimble, and they like it that way. Because, let’s face it: their unique, infectious culture makes it easy to get things done. But what happens when larger leading organizations want to activate more grit, authenticity and passion in their environments? How do “intrapreneurs,” the innovative team leaders and space-creators in big businesses, reconnect with that startup mindset without getting weighed down by the sheer scale of a large enterprise? Is it possible to ignite an entrepreneurial spirit—or reclaim—a sense of “startup culture” no matter what size the company? For the past year, turnstone has been asking these questions of entrepreneurs in startups and of intrapreneurs within ecosystems of large organizations. Our exploration of culture and its organic link to the physical workplace has produced compelling observations about shifting behaviors. Here’s what we’re learning about entrepreneurs looking to accelerate business results by leveraging their culture and space, and about intrapreneurs looking to reinvent the culture of their large organization. A casual, non-corporate environment, or what we’re calling “startup culture,” is a highly prized component of countless entrepreneurial ventures. It puts personalities on display and allows people to have fun together and work in ways that best suit them. This culture translates as “unbuttoned and non-corporate”—a flexible, authentic environment that engages employees, allowing them to experience a sense of meaning and belonging. “We believe that space is a tool to build culture, engage human capital and, over time, improve a brand,” says Kelly Ennis, founder and managing principal at Baltimore’s The Verve Partnership, a client-focused architectural firm dedicated to marrying design-driven conversations and strategic business opportunities. As a designer, Ennis recognizes that achieving startup culture requires intentionality. Sam McBride, co-owner, RxBar, Chicago, recognizes the role space, culture and brand play in client relationships and company growth. A recent study conducted by turnstone of over 500 small business owners confirmed this important connection. The study found that 80 percent of respondents recognize that physical space plays a direct role in fostering vibrant culture, while 90 percent stated that culture is not just a great perk but an important contributor to the success of the company. You’re trying to appeal to people going beyond sawhorses and a door. To appeal to people who don’t want to lose that edge, but who want some sense of organization, some sense of order. Not necessarily neat. But just not chaos. Though small companies often start out with a cool office vibe, we’ve learned that maintaining it over the long haul is more difficult—especially once companies hire their 10th employee. As founders begin to worry about instituting norms, policies and procedures to keep their businesses running smoothly, some find that the pressures of growing a successful business curb the carefree nature they once had when approaching life in the office. At the same time, intrapreneurs within larger leading global organizations are feeling a similar, yet distinct, pressure to be more nimble and agile. And although well-appointed surroundings, ample resources and years of experiences separate them from some younger companies, intrapreneurs are like-minded in their willingness to challenge the status quo. top, staying focused on optimizing their product or service offerings. Intrapreneurs, on the other hand, push boundaries and ask tough questions. Turnstone recently conducted a survey with 515 companies employing no more than 100 people each. Intrapreneurs also realize they are competing with startups to attract, retain and engage talent. Whether they lead teams in product development, HR, IT, marketing, sales or the C-suite itself, intrapreneurs know that if their spaces don’t reflect cultural ideals, their organization won’t stay ahead. Sitting in diverse postures, especially lounging, is an immediate cue to workers that the culture is different and more relaxed. Turnstone research has shown that offering employees choices of where and how they work and giving them control over their day is a pivotal component of startup culture. 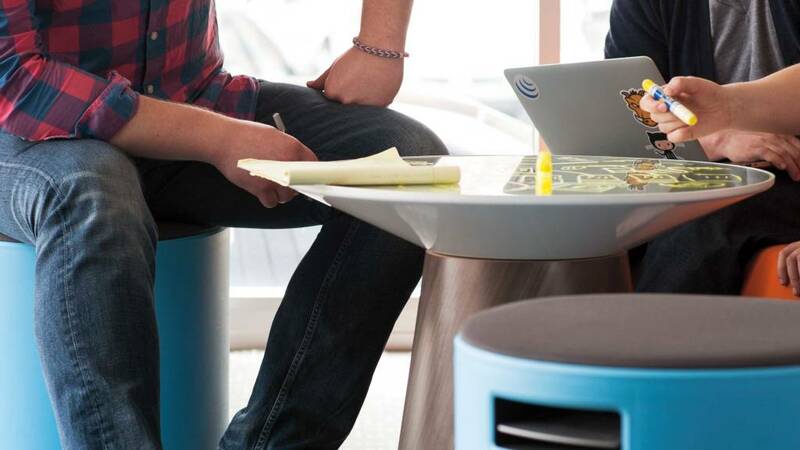 Encouraging a variety of postures is vital to creating an engaging workplace. Fusionary team members gather around Campfire Paper Table with glass top for impromptu collaboration. Alternative work postures can provide that freedom and help nurture a startup culture vibe. 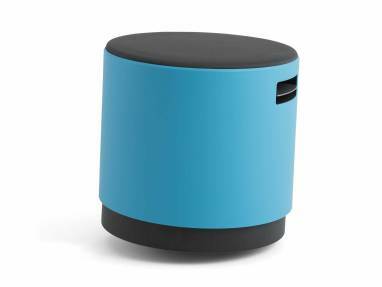 Turnstone research has revealed that of professionals aged 18–34 years, a whopping 32 percent prefer to work in lounge settings filled with ottomans, stools or other casual options that offer comfort and enhance productivity. Giving people the freedom to do what they want is a surefire way to drive culture. It’s incredibly important and appeals to both a younger and older demographic. Giving people freedom, while also managing quality, goes a long way in ensuring your desired outcome. The pace of today’s office has also made standing-height tables and desks sought-after destinations, as teams iterate and think in snatches of time between meetings. 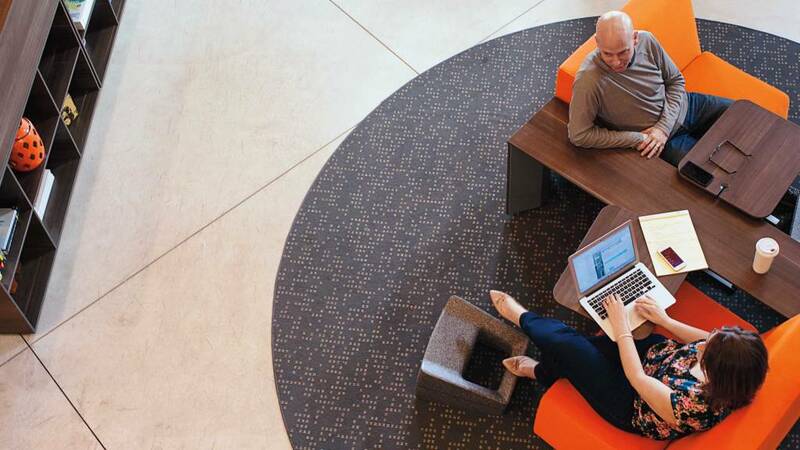 Rather than settling in at seated workstations to respond to emails, we’ve seen people regularly gravitate to height-adjustable tables or standing-height work surfaces where they can quickly move in and out of tasks. There’s a strong link between curation and the “do-it-yourself” spirit of many entrepreneurs and intrapreneurs. Whether applying unique choices in materiality or blanketing offices with artifacts that represent the founder’s passions, entrepreneurs have ignited a race for the most exciting workplaces. They leverage social media photo sharing to highlight what they like and what inspires them, and then relentlessly pursue curating a space to match. 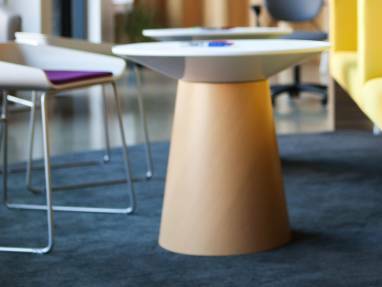 Campfire Slim Table, Skate Table and Footrest create a lounge environment that allows for easy collaboration. a 1900s theater building rich with architectural details and open 23-foot ceilings. What do these trends mean for entrepreneurs, people in real estate, space creators in larger organizations, facilities managers, incubators and disruptive thinkers everywhere? Is it really possible to ignite—or reclaim—a sense of “startup culture” in your workplace? 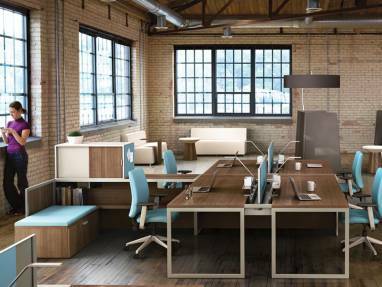 Add lounge spaces and standing-height elements to to complement ergonomic seating.Send the message that you trust and support your team to choose the places and postures that best encourage productivity and focus for them. Intentionally design other spaces that promote quiet, collaboration and fun, so that people can truly love the way they work.